I’m home after 3 days of hanging out with talented writers, still-not-acknowledging-they’re-writers-but-wishing-to-be, and lots of lovely volunteers, readers, and so on that fill a writers’ festival’s workshops and events. A few years ago, Sylvia Taylor told me that the writing life is about reaching down and reaching up. We share what we’ve learned and pull someone just beginning up to greater skill and confidence. We sit at the feet of masters and are stretched to grow a little more. A conference is a great source for this. Sometimes, conferences yield contracts. (Surrey http://www.siwc.ca is particularly good for this). Usually, conferences yield contacts. New friends and introductions to publishers/agents/editors are not uncommon. If you haven’t been to a conference, take the leap. There is something for all levels to learn. At the very least, being with ‘your tribe’ is a wonderful thing. Who else can relate to your habit of writing all night? 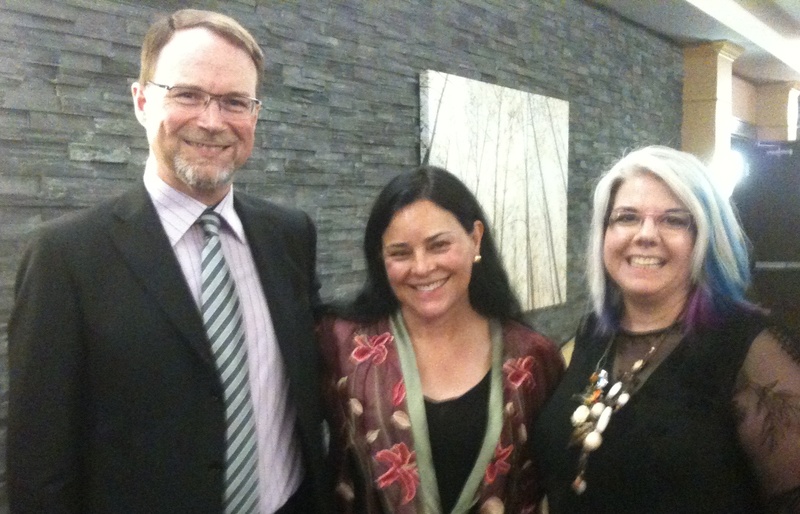 (Charles De Lint, Diana Gabaldon, and I all write after midnight. We’re not alone!) Who else can appreciate the voices in your head that you need to record? Who else can offer tips and suggestions to move your project along? Who else appreciates the significance of a ‘send the full manuscript’ in response to a query? Who else really knows about this mystical journey to make worlds out of nothing but imagination and words? Where else do you belong? I took a few things out of this year’s Word on the Lake. I attended a workshop by Anne De Grace on Writing Critique Groups. I have wished to be part of such a group for a long time, but hadn’t formulated the vision. This gave me concrete ideas. I kept my eyes open, and approached the first person I thought would also find value in such a group and be an asset. She agreed. So we will keep our eyes open for a third, and see where it goes. Thursday I have to be in a workshop at 8 a.m. my time. I need to be alert and absorbing information. I’ve been going to bed between 4 and 7 a.m. the last few nights, working through the greatest heat. My plan was to start last Friday, moving back an hour each night, but it didn’t work. It was 4:30 on Sunday and 3:30 on Mon, despite pharmaceutical aid. (I can stay up for hours after sleeping pill. My body relaxes, but my brain just keeps plugging along…) Wish me luck getting to bed at midnight tonight, with all my packing and preparations in order! to the time of aggregation. on rising wind born of wistful anamnesis. It is always bittersweet on the last day of a gathering, as participants return home. Graduation celebration, weddings, funerals, conventions, conferences, camp. The greater the anticipation of the event, the more melancholy the ending. Sometimes, the ending remains a clear memory, while the middle disappears. Do you have any poignant endings that you hold in your heart? I can’t coax them into poetry. “I just can’t appreciate it,” says one. “Poetry. Yeah. Whatever,” says the other. or feel the blackbird’s call. But soon, my tribe will come. of verse, pressed into prose. I’m looking forward to learning from Diana Gabaldon, C. C. Humphreys, Gary Geddes, Ursula Maxwell-Lewis, Carmen Aguerra, Carolyn Swayze, Howard White, and more! It’s always a fantastic weekend for a bargain price. You should come. Seriously.